The Futon mattress is built to give you the utmost levels of comfort and support when you sleep on them. You get up feeling revitalized and raring to go. We often take naps and rests at various intervals during the day to allow the body recalibrate to a more balanced state. Some people take these naps at work, at home or after a workout session. The Futon mattress will come in handy in any of these scenarios. You also might be having a guest come over to hang out and just watch TV. Surely you do not want them uncomfortable. The futon mattress is ideal for this scenario also. 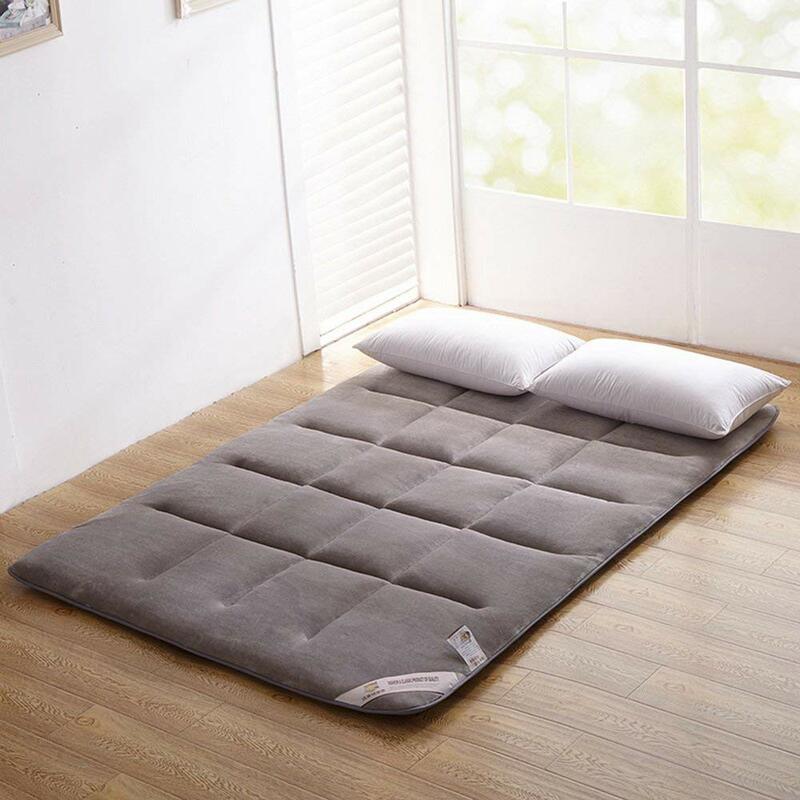 It is easy to overlook the futon mattress with the thinking that since you don’t sleep as much on them, they aren’t so relevant, but they actually serve a very important purpose. Sometimes, however, you may wish to purchase the futon, and you’re not big on the mattress, but if indeed you want to buy one that will last, you’re better off picking out your own mattress. Do not assume the mattress that comes with the futon is the most suitable. Generally, regardless of how great the futon is, the mattress that comes with them are typically of lesser quality than you’d expect. This is very common, and because of this, the futon is mostly in the market without as much advertising on the mattress that comes with it. This is the case because the manufacturers just include the mattress because people just expect them to be there. Their main focus is on the futon. Therefore a lot of companies do not put as much thought into the mattress that comes with the futon. There are a lot of factors to consider before making the decision on which futon to buy. Things like size, dimensions, materials used, etc. are all things you should think deeply about. This buying guide will help you make a better-informed decision based off of these factors. 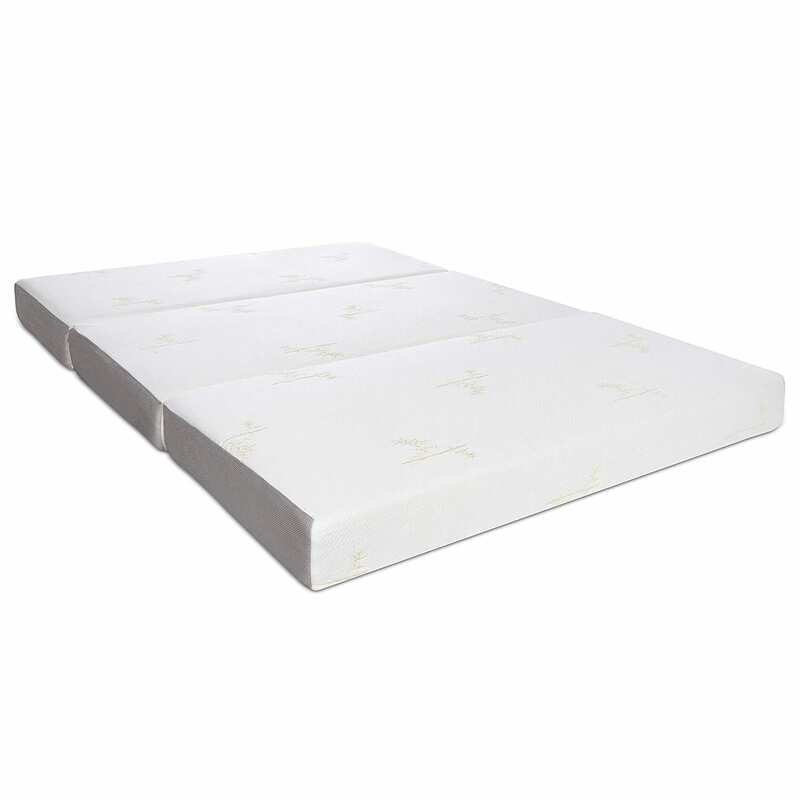 The Milliard memory foam tri-fold mattress was designed with comfort as a propriety. All you have to do is unfold the bed on the floor in any given space and settle in for a comfortable rest. This bed is suitable for sleeping wherever you are, and it is easily folded back into storage. Memory foams are popular for their therapeutic qualities, and this particular brand is properly ventilated for breathability and temperature regulation. It is very versatile and very suitable for guest that come over unexpected or impromptu get together that require some people sleep over. 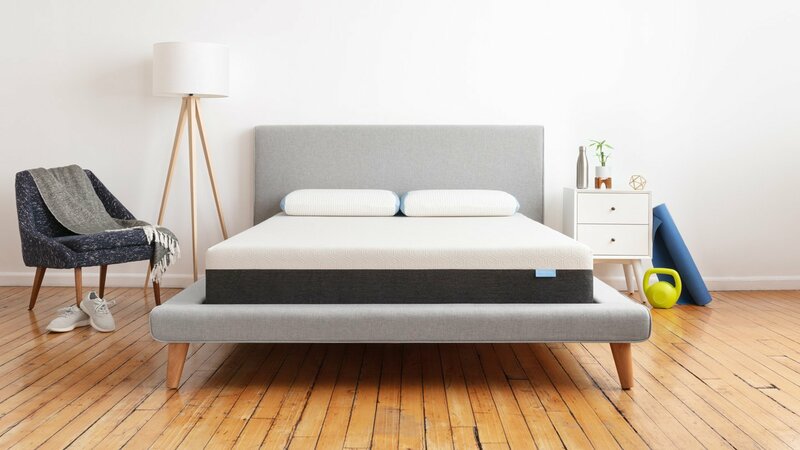 The Miliard mattress is made out of 1.5in of 3lb luxurious memory foam on top of a 4.5-inch supportive foam base for the best sleeping conditions. It very built to last and it doesn’t lose its shape after use due to its high-density construction. You get accessories like the removable jacquard ultra-soft bamboo cover and the anti-slip bottom. This foam has gone through all the required testing and come out in flying colors. There is no trace of hazardous chemicals such as ozone depletes, flame retardants, lead or heavy metals and other chemicals with adverse effects on the body and the environment. This mattress is versatile and can be used anywhere, on any terrain, indoor or outdoor. With its 6-inch depth and high-density construction, comfort is a given. CertiPUR-US certified: this means that the mattress has met all of the requirements of this standardization body and has been deemed suitable for use without any adverse effect on the body or the environment. Cool accessories: another advantage to getting this mattress is all of the cool accessories that come with it. One of which is the jacquard ultra-soft bamboo fiber with its non-slip bottom. Very easy to fold and put in storage. Some people have complained about the mattress being too soft, and in the same vein, others have complained that it is too hard. It is mostly due to preferences at the end of the day. These are the main cons, and it is important to note that floor mattresses are built to be used on flat surfaces and can be rolled up or folded. They are not so similar to the 8-inch pocket spring mattress with memory foam you might be accustomed to. The Futon mattress “Classe” is made up of the TEIJIN MIGHTYTOP® II ECO, which ensures the mattress is free of bacteria, dust mites, and odor. It utilizes a full hygroscopic cotton fabric for its outermost part. 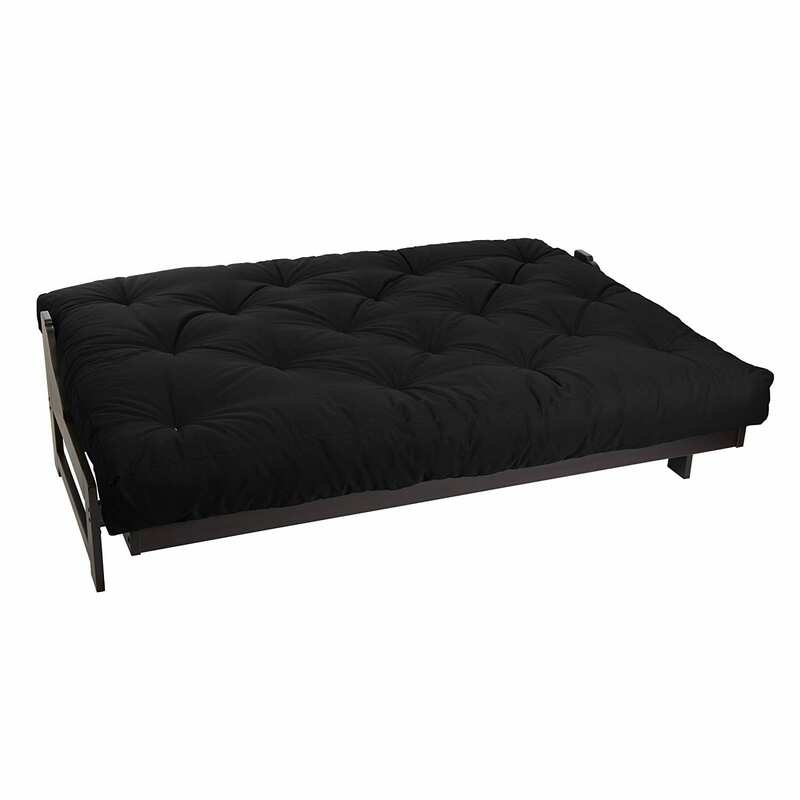 The mattress futon is packed with the TEIJIN MIGHTYTOP ® II ECO (50%). This also has anti-bacterial and odor controlling capabilities which can last for up to 3 years. The outer fabric is made out of 100% cotton. 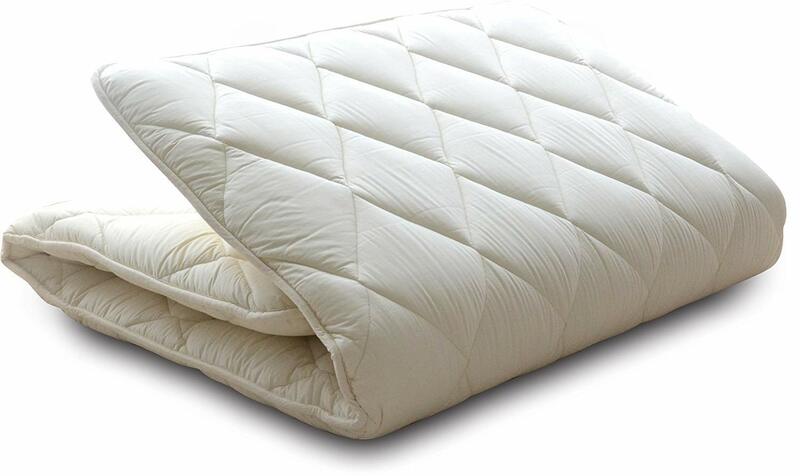 In between the two layers of the soft polyester quilt, you will find a firm polyester pad. This three-layered structure provides all the comfort and support you will need in a futon mattress. Please note that the futon is vacuum sealed at the point of delivery and is intended to open up into its original full size when opened. Easily folded and kept in storage when not in use. No need to worry about dust mites or mold. Some people have also complained that the mattress does not expand to its full intended size after opening. With this memory foam, you have the option to choose from many different colors depending on your preference and the tone and theme of your living space. The memory foam is soft and comfortable, and with the fabric laced unto its mattress, it has a unique look and feel. Designed to be used as a sofa or as a bed depending on necessity. This mattress is built with one piece of 1-inch Visco foam and three pieces of polyurethane foam covered with a fine cotton blend. It is further enclosed in a durable poly-cotton blend cover with lace tuft finish to give it a very pretty look. This futon is packaged in a vacuum sealed box so you will have to wait a few days after opening for it to regain its original size and for the wrinkles to stretch out. You can dust off with a dry cloth. Stay away from harsh cleaning products and do not allow spills to settle in. Store in a cool, dry place and keep the sun away from it. 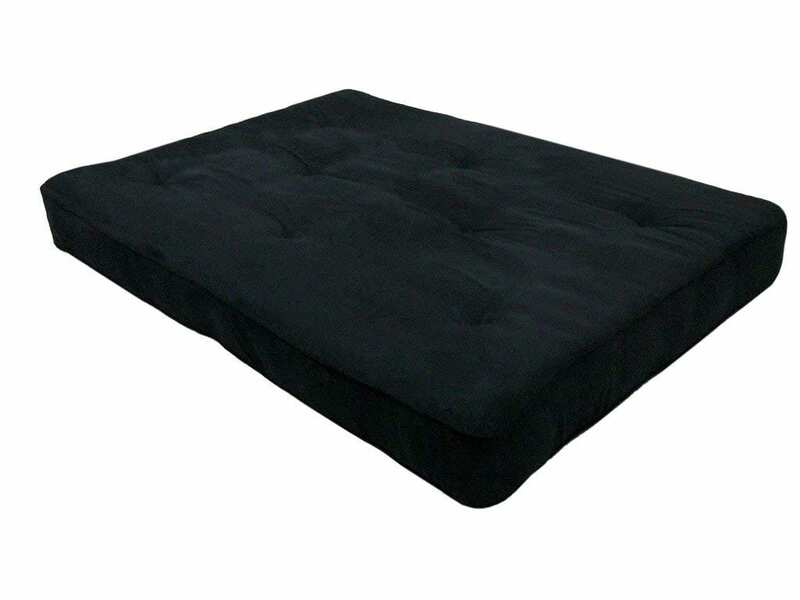 DHP’s 8-inch independently encases coil futon mattress is CertiPUR-US certified, and it is designed to offer excellent support and comfort with its 522 independently wrapped coils. It will complement any type of futon, and it is available in various colors. Very well packaged 15-gauge pocket coils with microfiber mattress cover. The full-size Westfield futon frame is unique for its rich heritage finish and the complexity in its design which gives it a sophisticated look. There is a lot of personality in its design, and it is built with a lot of pretty curves with opposing wooden slats to give it just the optimal amount of contrast to bring life to your room. This frame easily converts into a full-blown sofa. It is built with very durable materials and you are guaranteed of the utmost levels of safety. Futons offer practical solutions to your everyday needs. 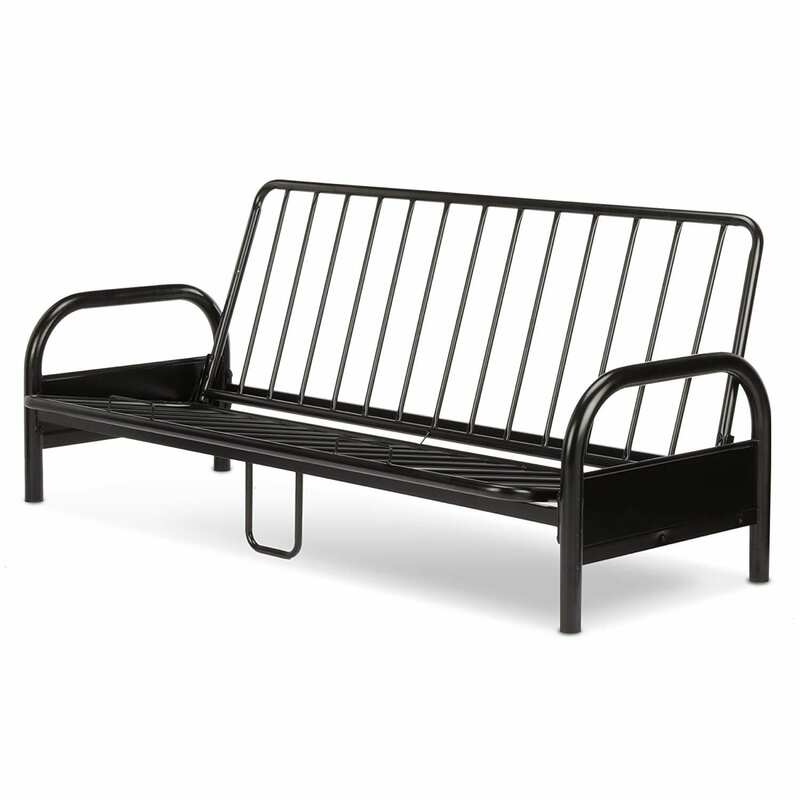 This futon is built to last with its steel structure and industrial frame with adjustable features. Another interesting feature of this Saturn is that is can be transformed from the classic sitting piece into a sleeping bed. All you have to do is pull the back of the Saturn towards you until it lays flat on the ground as a sleeping bed. It is built with very strong and durable steel and finished with an excellent black finish which gives it that extra style. The Saturn can be used anywhere from an office to your living room. The unit comes with a front deck, a back deck, and side panels. You will also c=find cross rails, instruction manual and some tools you will require for its assembly. Please note that a mattress is not included in this package. The Saturn also comes with a one year warranty against factory defects. 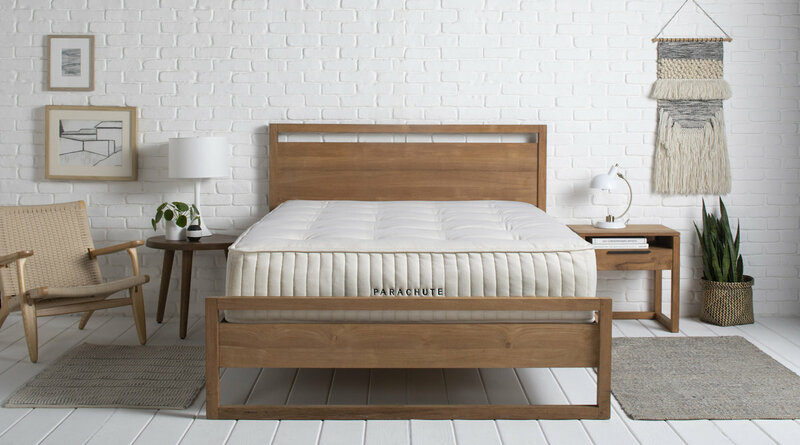 The Fashion Bed Group, a division of globally diversified Leggett & Platt Inc. has taken front row in the manufacture of fashionable beds, adjustable beds and a bunch of other bed accessories. Fashion Bed Group is always ahead of the curve in the bed industry, and they stay on top of trends with the right blend of finishes and designs that are always relevant. This mattress is known for its softness, comfort, and breathability. You can easily roll this unit up and store in a closet and roll back out and spread on the floor when needed. It is very suitable for those who are trying to make the best use of the limited space they have. It is also versatile and can be used outside the house in settings such as picnics, yoga sessions, work out sessions, massage studios, etc. since its so portable, you can take it along wherever you go. 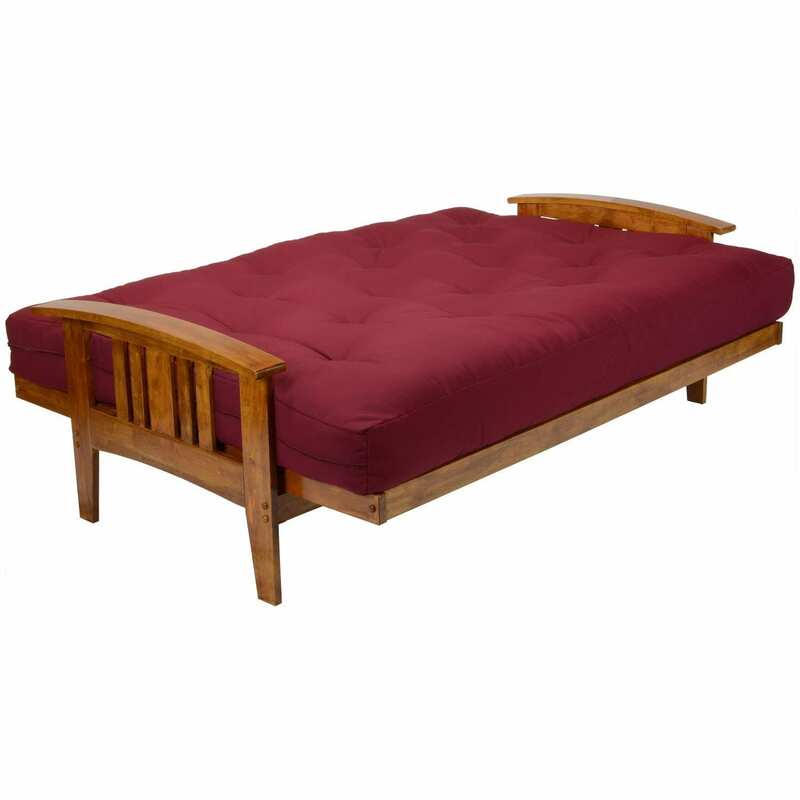 It can be a daunting task to get the most suitable futon mattress for your own specific needs. With a buying guide like this, that task is made much easier, and you can easily navigate between all the choices available to you. Cost of the mattress should be the last factor you consider, and you must place priority into other factors that will determine how comfortable and satisfied you will be at the end of the day. Some of the more important factors to be considered will be highlighted below. This might be a little tricky to examine especially if you don’t have prior experience but all you have to is think about the mattress you already have in your bedroom. 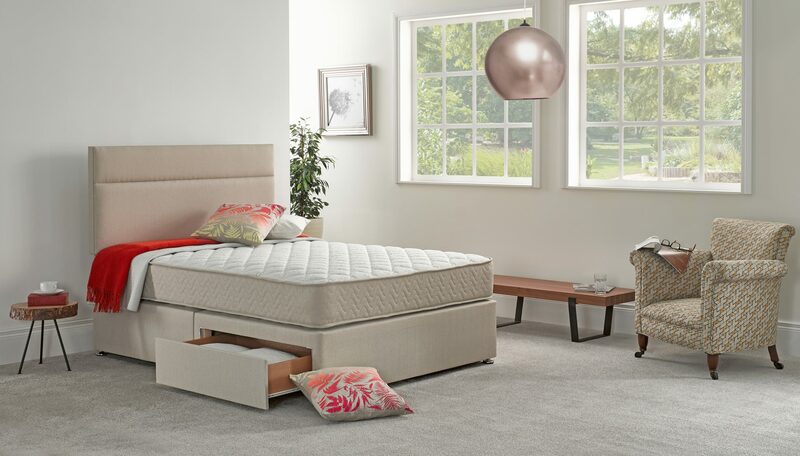 If you have a memory foam at home, then you know how comfortable it is and if you have an innerspring one you appreciate how much firmer it is and its bouncy feeling. Therefore picking out a mattress based on its construction will depend largely on the kind of feeling you want from it. If you are looking for a mattress meant for just sleeping and with support for your stomach or back, you might want to opt for the innerspring bed. If you enjoy sleeping on your side, you will be better off opting for a memory foam because it can adapt to your pressure areas while you are sleeping on it. If you want to go the spring route, find one with individually wrapped springs. These types offer better support for your body and motion isolation in the event that you are sharing the bed with a partner. Another important factor to consider before picking out a mattress is the way it folds. There are two main folding styles, the tri and bi-fold and both of them have their own peculiarities so you must be aware of these before deciding. Bi-Fold: these are the more popular ones you will find in the market. They are designed as a single fold running through the center. Most of these types of frames also come with a slider mechanism which you can alternate between the laying and sleeping position. It is a more straightforward design, and a lot of mattresses come with this feature. Tri-Fold: They operate in a similar manner to the Bi_folds, but you get an added advantage when it comes to the reclining position. Most of these frames have a leg rest which you can stick beneath the sitting area or extend when required. Comfort is the main priority. Everything else doesn’t matter if you don’t have the comfort you need. The aim is to sleep better, and every other thing is an additional or extra benefit. When it comes to comfort, the rule of thumb is the thicker the mattress, the more comfortable it is. A thinner one might not be as comfortable, and it may not provide you with the required support. Size is another important factor to consider especially if you don’t have as much space to spare. A queen sized mattress might be more comfortable to sleep on, but you have to consider how much space you are willing to forego just to have one. Choose a mattress that suits your needs and fits into the space you are working with. Cotton and Foam - most futon mattresses are constructed with a blend of polyester, cotton, and foam. These three materials are layered in various ways such that you can get the best of support and comfort. Even though they are suitable for sitting, they don’t do very well with prolonged sleeping. The bright side is that this category is most affordable. Innerspring – These mattresses come with the design you find with bed mattresses. Support and comfort are built in, and this makes them more suitable for prolonged sleeping or sitting. The material breaths well and this allows it to stay cool for an extended period of time. Due to its increased thickness, these usually come in the bi-fold futon category. Memory Foam – this material is very good because it is made up of the latex or polystyrene foam. They are also very easy to find in the market. One of the main advantages of using this foam is the fact that they quickly regain their original shape after your weight has been lifted off. The only drawback is that they are sometimes too thick when compared with other materials and they tend to stay warm in humid and hot climates. Whatever you intend to use the futon mattress for will inform your decision of which type to buy. A mattress with innerspring support is perfect for support, and if you are looking for something to use occasionally that is comfortable, durable and lightweight, then you can opt for the foam and cotton mattress. You are better off getting a mattress that can serve many purposes. The two main purposes are sitting and sleeping, and the mattress must be build flexible to serve these two purposes. The cover that comes with the futon mattress also determines how long the mattress will last. Also considering that the cover is what will be in contact with your body, it is important to get one with the best cover that will be gentle on your skin, comfortable and breathable. Frames typically come in the form of wood or metal. In some cases, only one material is used, and in other cases, both materials are used. Wooden Frames – this is the most common frame you will find in the market. You can opt for futon mattresses with armrests and other accessories such as cup holders and magazine racks for extra comfort. These different possibilities will be factored into the price also. For instance, hardwoods are the most popular but the most expensive. Metal Frames – even though they are less common compared to the wooden frame, they’re also more affordable. The main drawback here is that the metal futon frames are typically not as comfortable as the wooden frame futons. After you have considered some of the more important factors, the style and general outlook of the futon mattress can also be considered. You want something that is beautiful and compliments your living space so that you’re happy when you see it and you’re comfortable having guests over to see it in your house. This has been an in-depth guide on how to choose the best futon mattress and reviews of the best items on the futon market. There are various things you must consider such as size, materials, frame, and several other important factors. Feel free to comment below if you have your ideas to share.